When was the last time you sat down with a good book? Thanks to email, blogs, and Twitter, we’re reading more than ever, but this has left us with attention spans shorter than the average housefly’s. ReadMore is a little tool to encourage you to brush off that copy of Dickens or Dan Brown you’ve been meaning to read and actually get through it. 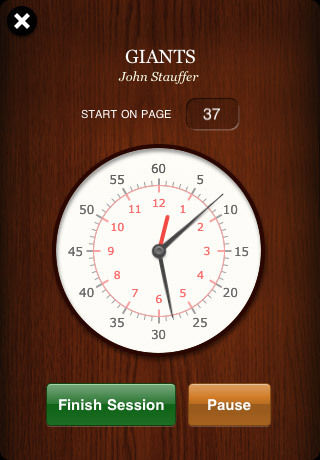 It’s essentially a fancy reading timer/diary. You type in the name of your book and the number of pages, and every time you’re ready to start a reading session, you turn on the clock. The timer keeps track of how long you read, even if the application is closed, but you have to remember to stop the clock when you’ve finished a session. At the end of the session, you mark what page you’re on, and ReadMore calculates your average reading rate and tells you how long it’ll take you to finish the book. You can add as many books as you like, and you can even add books you’re in the middle of. The general idea is to use all this data to track your progress and make an effort to improve over time. While the app is easy enough to use, I found the premise awkward, possibly because it felt so low-tech. When I first fired it up, I thought it might be attached to an e-reader in some way, so I could use it to automatically keep track of my progress while reading an e-book, but that was not the case at all. The app’s effectiveness relies entirely on its users to be self-disciplined about keeping track of their reading sessions, so it really feels like a glorified stopwatch. In order to get the most out of ReadMore, you have to be very motivated to keep accurate records, and I had a hard time remembering to use it. The menu is elegant and easy to use, but it felt tedious to type in every title and author, and it was even more tedious thumbing in my start and end pages every time. The app has a noble goal: “Read more!”, but instead of giving you a fresh technological innovation for books, it feels a lot more like a strict schoolmarm forcing you to keep a summer reading diary. AppSafari review of ReadMore was written by Tracy Yonemoto on March 29th, 2010 and categorized under App Store, Books, Reading, Utilities. Page viewed 4415 times, 1 so far today. Need help on using these apps? Please read the Help Page.